Steel is the backbone of many industries today, and carbon steel is reported to account for more than 85% of steel production in the world , which makes it the most widespread type of steel and is extensively used in industry. This is because of its availability, cost-effectiveness, and superior mechanical properties, which can be exploited simply by managing the chemical composition, primarily the carbon content, and by controlling the heat treatment which has significant influence on its mechanical properties. carbon steel is well defined by designation systems developed by the Society of Automotive Engineers (SAE) and the American Iron and Steel Institute (AISI) . Each general class is subdivided into numerous groups, with each grade identified. Specific grades of carbon and alloy steels have been designated by a four-digit AISI/SAE numerical index system which reveals its grade, based on standard chemical composition (AISI 1040). The carbon content in medium-carbon steels is in the range of 0.31 to 0.60% and the manganese from 0.60 to 1.65%. Due to their increased carbon content, the medium carbon steels can be used in quenched and tempered conditions. These steels are widely used in manufacturing shafts, axles, gears, crankshafts, couplings and forgings. Carbon steels with a carbon content of 0.40 to 0.60% C are also used for rails, railway wheels and rail axles . Heat treatment plays an essential role in enhancing the mechanical characteristics of carbon steel thereby improving its performance . Hence, the main objective of the project reported here was to find and evaluate the most effective heat treatment for AISI 1040 carbon steel so as to obtain the optimum combination of tensile strength, hardness and impact strength properties. It is well known that enhancing some mechanical properties may scale back some others, such as tensile strength and impact strength. The proposed heat treatment procedure was expected to have a significant benefit because it improved the mechanical properties without lessening the others. The purpose of this study is to establish scientific procedure sequences of suitable heat treatment to improve the mechanical properties of a specific grade of carbon steel and to get an optimum combination of tensile and impact strength properties and apply the same procedure in different applications and uses. This procedure would be used mainly in the production of parts which require high stress resistance and high wear applications, such as Automotive components, Carburized parts, Bushings, Machinery components, Oil rig parts, Mining equipment, Shafting, Gear blanks, Railroad parts and springs, and welding fields. According to Callister and Rethwisch , an iron-carbon phase diagram can illustrate the iron-carbon system of alloys containing up to 6.67% of carbon, disclosing the phase’s compositions along with transformations occurring in the alloys as their cool or heat. The mechanical properties of steel are primarily affected by its carbon content. Hence, carbon steels are defined on the basis of their carbon content. Carbon steels with total alloying elements of up to 2% can be classified as low, medium, high, and ultra-high carbon steels . In addition to their carbon content, heat treatment is another approach to enhancing the mechanical properties of carbon steel. Heat treatment refers to the controlled heating and cooling of metals to alter their physical and mechanical properties . It consists of heating, holding, and then cooling down the material to room temperature. It is sometimes done inadvertently, due to manufacturing processes that cause a local elevation of metal temperatures such as welding, cutting or forming. Heat treatment is often meant to improve the mechanical properties of the metal. However, it can also be used to regulate certain manufacturability objectives such as improved machinability, formability, and recovered ductility after cold working processes . Carbon steel AISI 1040 with the following chemical composition (Table 1) and mechanical properties (Table 2). Table 1. Chemical composition of AISI 1040 as received from the supplier. Table 2. Mean Tested Mechanical Properties of AISI 1040 Steel as received from supplier (Group A). A total of 108 (one hundred and eight) specimens of medium carbon steel AISI 1040 were prepared and accurately processed by machining to produce tensile, impact and hardness specimens based on standard specifications for each test. The specimens were divided into four groups (A, B, C, and D) containing three specimens each as a batch for every test. The average result from each batch was then taken for each subsequent test. Group A consisted of nine specimens from the material as received from the supplier (normalized condition; fine grain) without any heat treatment. These were divided into three batches for tensile, hardness and impact tests. Group B consisted of nine specimens which were tested after a hardening process and quenched in water. These specimens also were divided into three batches for tensile, hardness and impact tests. Group C consisted of forty-five specimens who were divided into five batches for tensile, hardness and impact tests, after a hardening process and quenching in water. They were then subjected to a tempering process for the quenched specimens by reheating to five different temperatures. Group D consisted of forty-five specimens who were divided into five batches for tensile, hardness and impact tests, after a hardening process and quenching in oil. They were then subjected to a tempering process for the quenched specimens by reheating at the same five different temperatures. All of the carbon steel AISI 1040 specimens were machined and processed for tensile, impact and hardness tests according to standard specifications. For the tensile test as in Figure 1 according to ASTM E8/E8M , the specimen dimensions were D=12.5 mm, G= 62.5 ± 0.1 mm, , and the cutting location of the specimen from is along the longitudinal axes of the virgin material rod. For the impact test, according to ASTM E23 , the specimen dimensions were illustrated in Figure 2 and the specimen orientation is along the fabrication axes of the raw steel bar which has a sqaure croos section of 10x10 mm. For the hardness test, the preperation carried out with respect to ASTM E18-05  as in Figure 2 and the samples were prepared from a steel rod with cross sectional cuts perpendicular to the longitudinal axes. Figure 1: Tensile test specimen according to ASTM E8/E8M-09 . Figure 2: a) Charpy impact test preparation according to ASTM E23  and b) Hardness test specimen preparation according to ASTM E18-05 . All the steel specimens were in form of normalized fine grain (about 50% ferrite and 50% pearlite structure). Groups B, C and D were heated to 860°C, and maintained at this temperature for 120 min soaking time with respect to the specimen’s mass factor, inside the furnace (Heat treatment furnace: model Spiro Therm, McEnglevan, 1200°C). Just after this period the austenitic transformation occurred, where the lattice structure of steel changes to a face-centered cubic (FCC) homogeneous composition (γ). The specimens were rapidly quenched separately in two different quenching agents, water and oil, as shown in Table 3. Diffusionless solid state transformation occurred resulting in an unstable martensite phase, as a result of the steel structure changing from a face-centered cube (FCC) (γ) to a body-centered tetragonal (BCT). Martensite is brittle, hard, with low toughness and low ductility, highly stressed, and with a retained austenite (γ) phase. Table 3. Quenching agents and tempering temperatures. The process of tempering involves controlled heating of previously hardened steel specimens (Groups C and D) at 205, 315, 425, 535 and 645°C respectively. Each batch of specimens was held for a soaking time of 90 min at these temperatures. The structure of martensite is unstable: carbon atoms diffuse from martensite to form a carbide precipitate and the concurrent formation of ferrite and cementite. This process allows microstructure modifications to reduce the hardness to the desired level while increasing the toughness and ductility. 1. Group B; the following results were obtained from Tensile, Hardness, and Impact tests, Table 4. Table 4. Mean results for Tensile, Rockwell Hardness, and Charpy Impact tests for Group B after hardening process. 2. Group C; the following results were obtained from the Tensile, Hardness, and Impact tests for all the specimen batches after the tempering process (see Table 5). Table 5. Mean results for Tensile, Hardness, and Impact tests for Groups C after tempering processes. 3. Group D; the following results were obtained from the Tensile, Hardness, and Impact tests for all the specimen batches after the tempering process (see Table 6). Table 6. Mean results for Tensile, Hardness, and Impact tests for Groups D after tempering processes. The initial structure of normalized AISI 1040 carbon steel consists of ferrite (α) and pearlite fine grain. Homogeneous austenitic structure (FCC γ phase) is achieved when it is heated above its upper critical temperature (860°C) and held there for 120 min (the soaking time is generally calculated as 30 min for every 25.4 mm2 cross-section area) (Verhoeven ). Rapid quenching in water and oil separately causes a martensite reaction to occur as an FCC austenitic transformation to a BCT (body centered tetragonal) which is brittle, hard, with low toughness and low ductility, highly stressed, and with a retained austenite (γ) phase when it is quenched in water. Table 4 shows the Rockwell Hardness results for Group B where the quenching agent was water and the specimens were not tempered. Water quenching creates a supersaturated solid solution and increases vacancies with carbon content in the quenched specimens. Thus, high hardness correlates with high resistance to slip and dislocation. The hardness of steel increases rapidly as the martensite percentage is increased; it is one of the most common methods of strengthening steel and the fracture energy measured in the three specimens tested was recorded in the range of 39-40 J. Oil quenching, however, produces martensite and Bainite structures with less hardness and more ductility. Figure 3 shows the Yield and Ultimate Tensile Strengths for the water and oil quenched groups after each tempering process. It is shown in the above figure, that with every increase in tempering temperatures the yield and ultimate strengths decline. 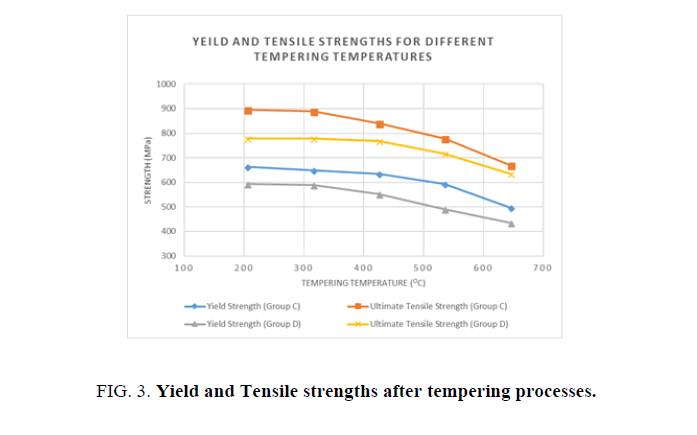 Figure 3: Yield and Tensile strengths after tempering processes. Higher values of Hardness are obtained when the quenching agent is water than when it is oil, as shown in Figure 4. Water is one of the most efficient quenching media if maximum hardness is required, but it may cause the article to be distorted and cracked. Where hardness can be sacrificed, mineral oil can be used. The heat transfer rate in mineral oil is much less than in water, thus achieving a slower cooling rate. Hence the result obtained from Ferrite and Bainite structures. The average cooling rate of still water is about 100°/S and the average cooling rate of still oil is 40°C/S, whereas the severity of still water is 3, while that of still oil is about 0.25 compared to water. The difference in the rate of cooling appears to cause a change in the phase structure of the steel. Hardness increases with any increase in the cooling rate due to the increased martensite phase in the whole structure . 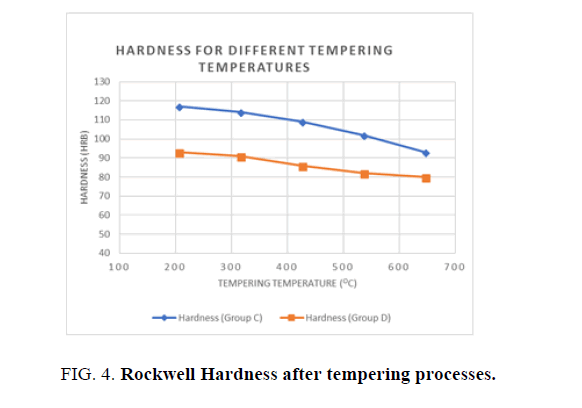 Figure 4: Rockwell Hardness after tempering processes. For the hardness and impact energy as functions of the tempering temperature (see Figures 5 and 6), it has been shown that Hardness decreases as the tempering temperatures increase, due to the decomposition of the martensite and precipitation of the cementite carbides. In addition, the toughness generally increases until it reaches a minimum value at the tempering temperature of 315°C. This phenomenon was shown in both groups where water and oil were used as quenching agents. The phenomenon of impact energy centered at temperatures ranging from 260 to 360°C is called tempered martensite embrittlement (TME). A change of this kind in Impact energy is caused by the transformation of the retained austenite to martensite. It is noted that higher hardness values were achieved with water as the quenching agent but better toughness values were observed when oil was used as the quenchant. 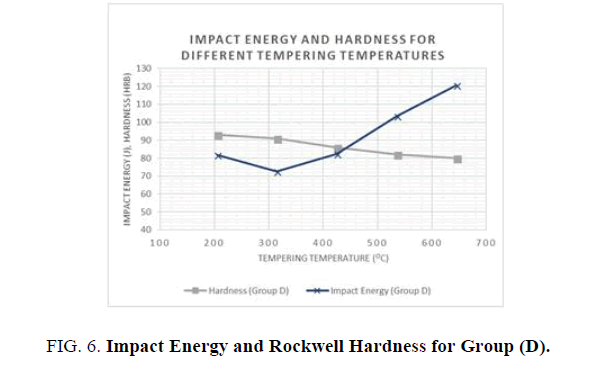 Figure 5: Impact Energy and Rockwell Hardness for Group (C). 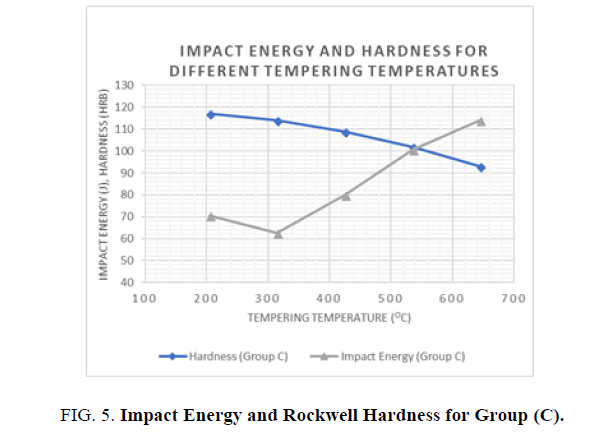 Figure 6: Impact Energy and Rockwell Hardness for Group (D). Martensite does not reach equilibrium or a metastable phase. The tempering transformation is a diffusion process depending upon temperature and time. If hardened steel is heated below AC1 (The temperature at which austenite begins to form during heating), the thermodynamically stable phase, ferrite phase and cementite phase are precipitated, the decomposition of martensite occurs instantaneously and causes the strength and hardness to decline, while ductility increases, and impact properties improve. At low tempering temperatures, the martensite may form two transition phases, a lower carbon martensite and a very fine non-equilibrium Epsilon carbide Fe2.4C (ε). The steel is still stronger, brittle and harder than before tempering. At higher tempering temperatures stable ferrite and Fe3C, form and steel become softer and more ductile. If the steel tempering is just below Ac1, the cementite Fe3C become very coarse and the dispersion strengthening effect is greatly reduced. The results of reheating the hardened specimens of the two batches, one quenched with water and the other with oil, for tempering processes at temperatures 205, 315, 425, 535, and 645 °C are shown in Table 4 for one batch and Table 5 for the other. Using the diagram of isothermal transformation for austenite decomposition products for plain carbon steels quenched and held at various temperatures below A1 (eutectoid temperature) can explain the change in mechanical properties due to the change in 0.4% C steel structures and the phenomena of the tempering stages at different temperatures. The mechanical properties obtained from tested specimens in tensile, hardness and impact tests at tempering temperatures of 205, 315, 425, 535, and 645°C are shown in in Table 4 for one batch and Table 5 for the other, and FIGs. 3-6. Different heat treatment scenarios result in a various combination o f enhanced mechanical properties. Quenching agent and tempering temperature have a significant effect on the mechanical properties of AISI 1040 Steel. In general, higher tempering temperatures increase the toughness and reduce the hardness and the ultimate and yield tensile strengths. Lower tempering temperatures below 320°C have a negative effect on hardness and toughness, as well as yield and ultimate tensile strengths. When hardness and strength is prioritized, it is recommended to use water as the quenching agent and lower tempering temperatures, but when toughness is prioritized, oil as a quenching agent is preferable, with higher tempering temperatures. Fouad A. Ali conceived and designed the experiments; Khaled R. Alrashdan and Mohey Aldeen M. Khedr, analyzed the data; Khaled R. Alrashdan performed experimental analysis; Khaled R. Alrashdan, Fouad A. Ali, and Mohey Aldeen M. Khedr contributed the literature review, discussion and wrote the paper. Bringas JE. handbooks of comparative world steel standards. ASTM international; 2004. American Iron and Steel Institute (AISI). 2017. Available online: http://www.steel.org/ (accessed on 20/11/2017). Verhoeven JD. Steel metallurgy for the non-metallurgist. ASM International; 2007. Bhateja A, Varma A, Kashyap A, Singh B. Study the effect on the hardness of the three sample grades of tool steel ie EN-31, EN-8 and D3 after heat treatment processes such as annealing, normalizing and hardening and tempering. International Journal of Engineering and Science. 2012;1(2):253-9. Callister WD, Jr. Rethwisch DG. Materials Science and Engineering, 9th ed. ; John Wiley & Sons: Hoboken, NJ, USA, 2010. Fadare DA, Fadara TG, Akanbi OY. Effect of heat treatment on mechanical properties and microstructure of NST 37-2 steel. Journal of Minerals and Materials Characterization and Engineering. 2011 Mar 5;10(03):299. Dossett JL, Boyer HE. Practical heat treating. Asm International; 2006. Standard AS. E8," Standard Test Methods for Tension Testing of Metallic Materials. Annual book of ASTM standards. 2013;3:57-72. Kuhn H. Medlin D. Committee, AIH. Mechanical Testing and Evaluation; ASM International: Materials Park, OH, USA, 2000. ASTM International. Standard Test Methods for Rockwell Hardness of Metallic Materials; ASTM E18-17e1; ASTM International: West Conshohocken, PA, USA, 2017.